Edge protection G51NA-PA6-NA, PA6, 4.3x3.9mm Flexible polyamide seal with dimensions 4.3 x 3.9 mm, white color and working temperature from -60°C to + 95°C. Edge protection G51NB-PA6-NA, PA6, 4.3x4.6mm Flexible polyamide seal with dimensions 4.3 x 4.6 mm, white color and working temperature from -60°C to + 95°C. 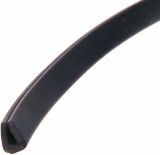 Edge protection SM1-PVC-BK, PVC, 6.3x5mm Flexible PVC seal with dimensions 6.3 x 5 mm, black color and working temperature from -65°C to + 105°C. Thru-hull connector ф 32 x 19 mm, a rubber Thru-hull ф 32 x 19 mm for console or distribution box. Plastic Sealing,1611, Ф40x27 mm Plastic Sealing,1611,for pipe dimensions 16, 25, 32 mm. Plastic Sealing, 1618, ф40x29 mm Plastic Sealing, 1618, for wiring box. List Price 0.90лв. VAT Incl. 0.86лв. VAT Incl. 0.81лв. VAT Incl.